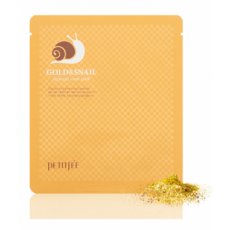 Petitfee Gold & Snail Hydrogel Mask is a 2 piece mask that tightly accomodates the upper and lower part of the face for a non-dripping but hydrating hydrogel mask session. Formulated with snail slime extract to keep your skin elastic, firm and smooth; and pure gold that instantly soothes the skin upon application and keep it bright! is a 100% hydrogel mask: hydrogel is water in the form of jelly to transfer exceptional hydration on the skin. Unlike sheetmasks, hydrogel packs absorb most moisture and essences. You'll notice that after application, the mask had become thinner, because the skin had absorbed the nutrients. also balances oil and moisture level of the skin. Hyrogel mask absorbs excess sebum from your skin. great for daytime use before a great event! Cleanse and tone your skin, then apply the hydrogel mask by removing the plastic foil first. Smooth the upper part, then the lower part. Let it sit for 30-40 minutes or longer if your skin is in poor condition. Pat remaining essences on the skin. Follow with your normal skincare treatments according to your skin needs.